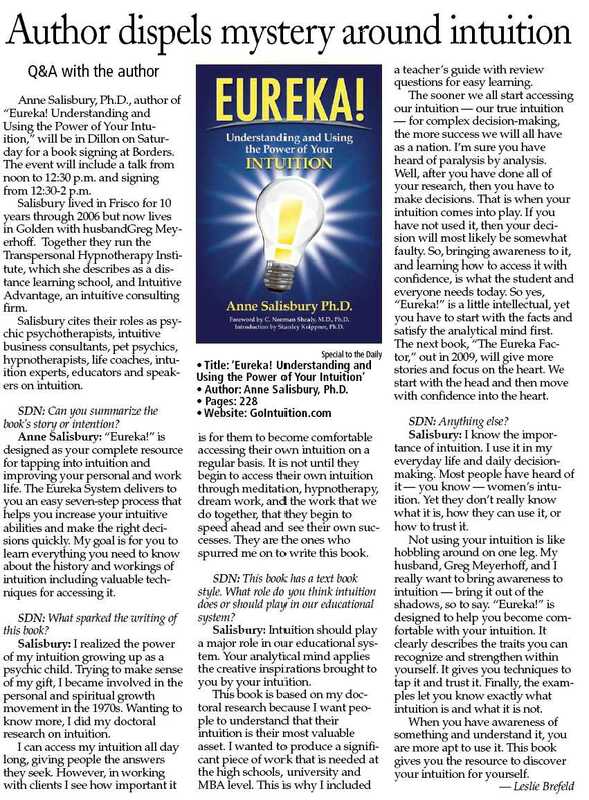 Anne Salisbury, PhD, author of “Eureka! Understanding and Using the Power of Your Intuition,” will be in Dillon, Colorado on Saturday for a book signing at Borders. The event will include a talk from noon to 12:30 p.m. and signing from 12:30-2 p.m.
Salisbury lived in Frisco for 10 years through 2006 and now lives in Golden where she and her husband Greg Meyerhoff run the Transpersonal Hypnotherapy Institute, which she describes as a distance learning school, along with the Intuitive Advantage, an intuitive consulting firm. Salisbury cites their roles as psychic psychotherapists, intuitive business consultants, pet psychics, hypnotherapists, life coaches, intuition experts, educators and speakers on intuition. SDN: Can you summarize the book’s story or intention? Anne Salisbury: “Eureka!” is designed as your complete resource for tapping into intuition and improving your personal and work life. The Eureka System delivers to you an easy seven-step process that helps you increase your intuitive abilities and make the right decisions quickly. My goal is for you to learn everything you need to know about the history and workings of intuition including valuable techniques for accessing it. SDN:What sparked the writing of this book? Salisbury: I realized the power of my intuition growing up as a psychic child. Trying to make sense of my gift, I became involved in the personal and spiritual growth movement in the 1970s. Wanting to know more, I did my doctoral research on intuition. I can access my intuition all day long, giving people the answers they seek. However, in working with clients I see how important it is for them to become comfortable accessing their own intuition on a regular basis. It is not until they begin to access their own intuition through meditation, hypnotherapy, dream work, and the work that we do together, that they begin to speed ahead and see their own successes. They are the ones who spurred me on to write this book. SDN:This book has a text book style. What role do you think intuition does or should play in our educational system? Salisbury: Intuition should play a major role in our educational system. Your analytical mind applies the creative inspirations brought to you by your intuition. This book is based on my doctoral research because I want people to understand that their intuition is their most valuable asset. I wanted to produce a significant piece of work that is needed at the high schools, university and MBA level. This is why I included a teacher’s guide with review questions for easy learning. The sooner we all start accessing our intuition — our true intuition — for complex decision-making, the more success we will all have as a nation. I’m sure you have heard of paralysis by analysis. Well, after you have done all of your research, then you have to make decisions. That is when your intuition comes into play. If you have not used it, then your decision will most likely be somewhat faulty. So, bringing awareness to it, and learning how to access it with confidence, is what the student and everyone needs today. So yes, “Eureka!” is a little intellectual, yet you have to start with the facts and satisfy the analytical mind first. The next book, “The Eureka Factor,” out in 2009, will give more stories and focus on the heart. We start with the head and then move with confidence into the heart. Salisbury: I know the importance of intuition. I use it in my everyday life and daily decision-making. Most people have heard of it — you know — women’s intuition. Yet they don’t really know what it is, how they can use it, or how to trust it. Not using your intuition is like hobbling around on one leg. My husband, Greg Meyerhoff, and I really want to bring awareness to intuition — bring it out of the shadows, so to say. “Eureka!” is designed to help you become comfortable with your intuition. It clearly describes the traits you can recognize and strengthen within yourself. It gives you techniques to tap it and trust it. Finally, the examples let you know exactly what intuition is and what it is not. When you have awareness of something and understand it, you are more apt to use it. This book gives you the resource to discover your intuition for yourself.